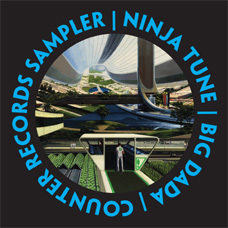 "As Ninja continue to sign more new acts to all three record labels and release more than ever brand new material it makes it exactly the right time for us to team up with Plan B in order to bring you a 15-track sampler of choice cuts. Specially selected for Plan B, the lineup includes exclusive tracks from Speech Debelle, Two Fingers w/Sway, King Cannibal, X-Rabbit and DMGeez, The Long Lost, K-The-I??? and a Moody Boyz remix of the Roots-man himself." At this moment in time we're unsure if 'Flower Of Flesh And Blood' is going to be on the King Cannibal album, so it may well be the only time it appears on CD. Someone PLEASE rip this CD!